Amazon Kindle for $399 with free shipping. * Wireless connectivity enables you to shop the Kindle Store directly from your Kindle�whether you�re in the back of a taxi, at the airport, or in bed. 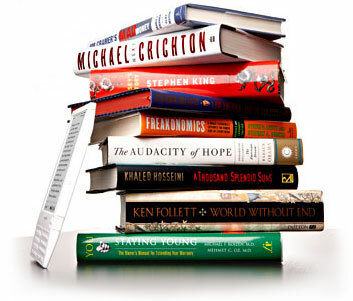 * More than 90,000 books available, including more than 90 of 112 current New York Times� Best Sellers. * New York Times� Best Sellers and all New Releases $9.99, unless marked otherwise. * Top U.S. newspapers including The New York Times, Wall Street Journal, and Washington Post; top magazines including TIME, Atlantic Monthly, and Forbes�all auto-delivered wirelessly. * Top international newspapers from France, Germany, and Ireland; Le Monde, Frankfurter Allgemeine, and The Irish Times�all auto-delivered wirelessly. * More than 250 top blogs from the worlds of business, technology, sports, entertainment, and politics, including BoingBoing, Slashdot, TechCrunch, ESPN's Bill Simmons, The Onion, Michelle Malkin, and The Huffington Post�all updated wirelessly throughout the day. * Unlike WiFi, Kindle utilizes the same high-speed data network (EVDO) as advanced cell phones�so you never have to locate a hotspot. * No monthly wireless bills, service plans, or commitments�we take care of the wireless delivery so you can simply click, buy, and read. * Includes free wireless access to the planet's most exhaustive and up-to-date encyclopedia�Wikipedia.org.